The Activity Manager schedules and tracks all employee activities. This includes all contacts made by an employee as well as all activities that an employee engages in while using Cyrious. All activities by all employees are available for viewing by all employees. Close – Closes an unedited screen. This calendar view of the activity manager allows you to organize and view activities in a sequential manner. Pictured here is a daily view of a single employee containing both timed and non-timed activities. The left side of the screen displays timed activities, whereas the right side of the screen shows non-timed activities. Viewing Calendar For – In this screen capture, the scroll bar to the left of the timed activities shows a list of all employees and parts currently used in Control. Here, the Store Owner has been selected with a check mark. You may select as many employees and parts as you wish. Their activities will all show on one calendar. This may be helpful if you are trying to plan a meeting and you want to check the availability of multiple employees. Show Completed – Selecting this box reveals all activities, including those already completed. Completed activities have a strike-through. Calendars – Use the calendars in the top right-hand portion of the screen to select one or more days to view. Click on a single day to view, click, and drag through a grouping of days to view. Filters – Reveal a list of activities from which you can select. Use this option to include only those activities necessary in the list of activities. By right clicking on the calendar, you are given the option to add new calls, appointments, meetings, work assignments, etc. The Print button on the right hand Activity tool bar gives you many options for printing that will help you keep track of past and present assignments. 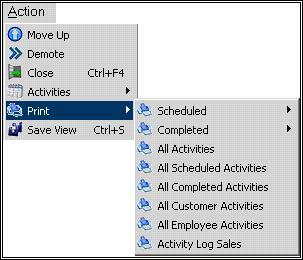 Scheduled – Expands to give the User the option to print scheduled customer, employee, estimate, or order activities. Completed – Expands to give the User the option to print completed customer, employee, estimate, or order activities. All Activities –Prints a report of all scheduled and completed customer, employee, estimate, and order activities. All Scheduled Activities – Prints a report of all scheduled activities. All Completed Activities – Prints a report of all completed activities. All Employee Activities – Prints a report of all scheduled and completed employee activities. 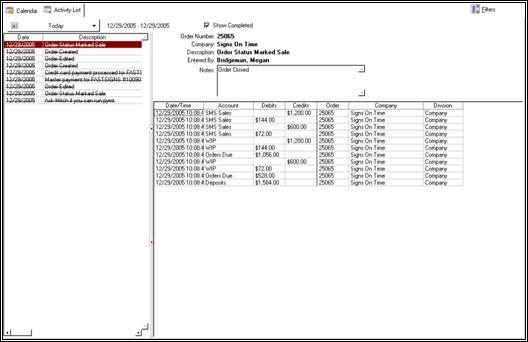 Activity Log Sales – Prints a log of all sales activities. Activity List for this Month – Prints a list of all activities from the current month. Activity List for this Week – Prints a list of all activities from the current week. Activity List for Tomorrow – Prints a list of all activities for tomorrow. Activity List for Today – Prints a list of all activities for today. 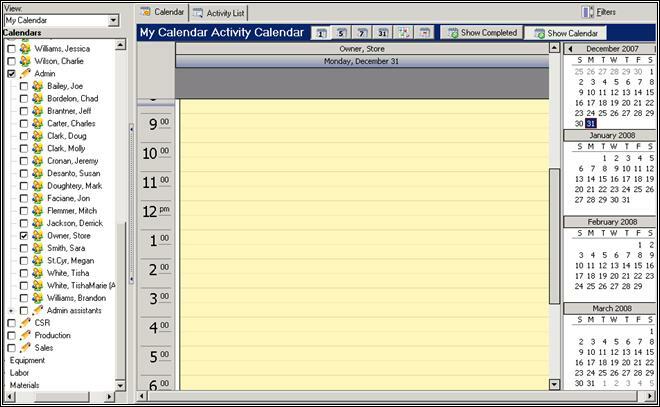 You may find a simple list of activities more advantageous than a calendar view. Use the Activity List tab to view all activities as a list. Here, the left-hand portion of the screen is the list of activities to complete. The right-hand portion of the screen displays general information, where you can view activity details. The selection button at the top right hand corner of the screen drops down and prompts the User to select what dates to display in the current view. Use the New Appointment screen to enter information about a new activity. This screen appears in the Calendar view when you click and drag to select a block of time, or when you right click on the timed or non-timed activity screens. This option is also available from the Activity List view, and on the Main Menu | New menu. 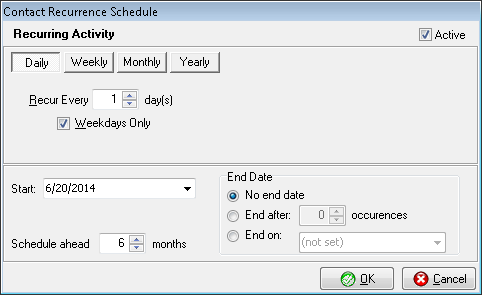 Add/Remove Calendars – Select this button to add employees or parts to a scheduled activity. If there are multiple employees or parts displayed in the Calendar view, they will all appear in this list, and all of them will be assigned to the activity. Contact Type – Check the appropriate box for your activity type. Activity (Other, Call, Appointment, Meeting, To Do) Type, Description, and Location – You may either type in the information into these fields or select from the drop-down boxes. Order - Type the order number here or click on the small magnifying glass to search for the order number. Company - Type the company name here or click on the small magnifying glass to search for the company. Notes - Type any notes for the activity here. Scheduled Date - Check the appropriate time and date for your activity. Please note that the recurring activities are first populated 25 minutes after the SSLIP has started, and from then on it is determined by your Activity Manager settings located in System Setup. The default is set to 6 hours, but can be set to occur much more frequently if you choose to do so. In Order to Edit any Recurring activities (assign to a different user), or Delete them completely from the system: Choose the main menu Sales & Marketing, and then Recurring Activities. When an assigned activity is complete, click on the Complete button. A screen will appear prompting you to enter information regarding the completion of that activity. Once an activity is completed, it will only appear in the Activity Manager when the Show Completed check box is checked. If more than one employee is scheduled for an activity, when you mark the project complete, you will be asked if one, some, or all the employees involved in that activity have completed it. Notes –Enter in any details about completion of the activity. Result – Select a result for your activity from the drop-down box. Schedule Again/Copy Notes –You may choose to schedule the completed event again later. Check the Schedule Again box. You can copy the notes that you have made for that activity in the future activity. You may also choose to clone that activity. Completion Time – If you have chosen to schedule a time for an activity, you may use this section to enter a precise time for that activity. Select the Custom Time radio button to activate the time selection fields on the right hand side of the screen. Employees should use Activity Manager as a device to manage their own time and see how others are using their time. Keeping all employees informed of the daily activities of others, even those in different departments, helps employees comprehend what other departments need to function to full potential. Much of the efficacy of the Activity Manager depends on using the Options Setup and filters to mold the Activity Manager to your needs. Simple setting changes will save you valuable time and mild aggravation over the course of your workday. You can set options for the store as a whole by selecting Store Options from the left-hand selection chart. An employee can also choose his/her own specifications by using the User Options selection choices. Timed activities appear in the Calendar view. Use these for organizing or tracking daily activities. You can assign a company, estimate, or part to a timed activity to help manage billed hours. You can also assign a service ticket to an activity to help manage support time. Often, salespersons or support staff may need to make numerous calls or perform quick activities throughout the day. Create non-timed activities for these kinds of things. You will retain a list without having to complete extraneous forms. Sending emails from Control may help make your staff more productive, as they can perform this task without having to toggle between windows. When entering in the message, you can select from the Merge Fields drop down selector to insert pre-saved information, such as a standard Thank You note for a customer who has just placed an order online. Use the Macro Activity to enter information about a Macro Activity. Description, Macro, and Reminder - You can type a description as well as select a macro type and reminder. Priority - Select a priority type for the macro.